Healing as a spiritual walk... literally! Erica Davis is a patient that my wife has treated that suffered a spinal cord injury due to a vascular defect that bled and put pressure on her spinal cord, taking away her ability to walk. She had been a healthy competitive tri-athlete and suddenly became unable to walk. She soon found out that health insurance doesn't pay to help you walk. It only pays to teach you how to go from your chair to the bed and back. Awakenings Health Institute and Project Walk are programs that believe most spinal cord injured patients can regain their ability to walk with the proper stimulation. 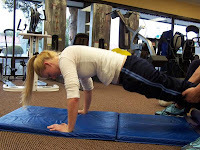 It is an aggressive training program that uses exercise to stimulate the regrowth of spinal nerve function. There are a number of research studies that show that exercise is a major factor in maintaining the health and growth of the central nervous system. Many spinal cord injured persons have intact spinal cords that have been traumatized, but have a potential, under the right stimulation, to recover much of their function. In my opinion, the lack of willingness by insurance companies to cover this rehabilitation is a major moral fault. In addition to not covering the rehab there is a lack of availability of information. Unless a person is aggressive, the medical system tends to guide you into less than ideal solutions that essentially give up on the possibility of recovery. Because many medical insurance companies are publicly traded the advantages of pooling funds to help people are lost because these funds are taken away to pay shareholders, CEOs, and a whole groups of employees hired to dole out as little care as possible. The care that is given tend to be therapies that the insurance company can invest in such as pharmaceuticals. This way money is sent into investments that emphasize the desire of the insurance company to retain profits rather than help people get well. The care that does require an actual person to treat has been made more and more difficult by such methods as capitation, which requires a caregiver to take care of all the patients in their area for one flat fee. This rewards caregivers for not giving care because the more care they give the less money they make. This is why many doctors are overloaded with patients and to survive have to choose those medical solutions that move people through the system by treating symptoms rather than taking the time to look at the whole person. There is also less incentive to be innovative because innovation makes more people want to come in to get treated with even less returns and more work. While we are waiting for this terrible system to get fixed there is a great need for the type of care that Awakenings Health Institute and Project Walk offer. There are many spinal cord patients that are willing to put in the work required to get back their ability to walk, but don't have the funds to get treated. Often their injury takes away their ability to make a living placing them even further behind. Right now Erica has a Donation Site where you can purchase many different items that you normally buy and help her and others get the treatment they need. I would invite you to give as you are able to support programs like these that offer hope and practical solutions to spinal injured persons to gain their optimal potential. Erica is now on staff at Awakenings Health Institute. One of the founders and many of the staff are not only health professionals but recovered spinal cord injured patients. 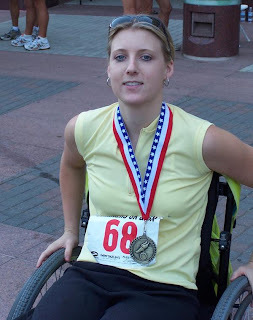 Erica has been competing in handcycle races and has met many people including Robin Williams, champion triathletes, and others who have encouraged her in her work to make life flow. She is showing many encouraging signs and continues to make progress toward her goal of walking. P.S. After being asked to take a picture with her, sitting on her lap, Robin told her, "This is the most fun I have had all day!" He and others were there to support all the members of the Challenged Athletes Foundation.